The German military performance during World War Two. Part III of the assessment of the fighting power of the Wehrmacht in WW2. German paratroopers with a 7.5-cm PaK 40 behind a barricade defend a street in Rome during the Allied advance on the city end of May 1944. With the development and refinement of the ‘Quantified Judgement Method for Analysis of Historical Combat’ – QJMA – the ‘Historical Evaluation and Research Organization’ (HERO) has set up a database of more than 100 battles of the Second World War and additionally data from the wars in Korea and the Middle East. Of these, 75 battles between German and Western Allied divisions and army corps are listed below, with a summary of some of the data that were collected for each of these battles. There are troops, tactical behavior, success and failure, loss and fighting power and the ratio of soldiers of both sides. 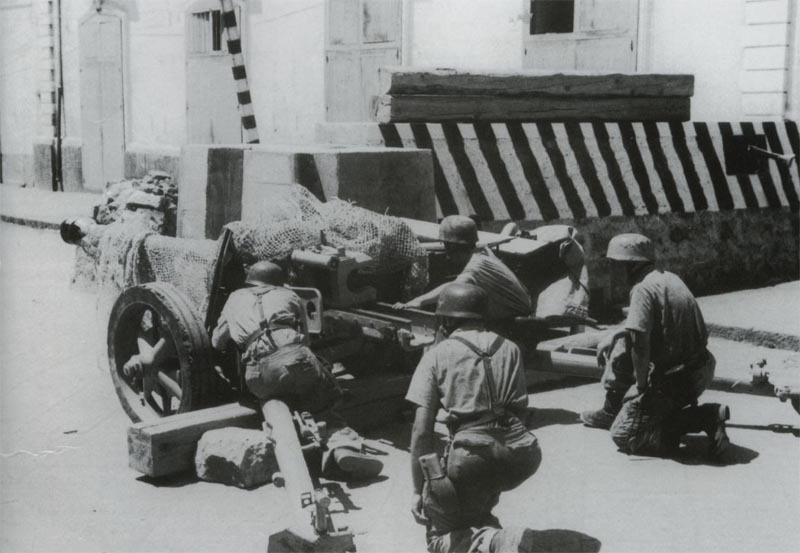 With the invasion of Sicily on July 10, 1943, the Western Allies had entered the weakest part of the allegedly ‘impregnable fortress of Europe’. This was followed by the arrest of Italy’s dictator Mussolini and the subsequent fall of the most important German ally in Europe. It was true that the German front in Italy could only be slowly pushed back from Salerno to the Gustav line, Monte Cassino, and the Allied landing at Anzio until the breakthrough of the Goths line, but the conquest of Rome by the Allies on June 4, 1944, was the beginning at the end of Nazi Germany, only two days later, the invasion of Normandy followed with the subsequent battles in France and at the German frontier. The last row is called score, which is a score or grade based on the evaluation of the previous figures. This value indicates the losses per day as a percentage of the forces that caused these losses; it is determined by setting the losses of one side to the total personnel strength of the other side. Thus, the value shows losses per day per 100 men. The score effect value is modified to the adjusted approximately determined defenders advantage. Here, a factor is applied, which resulted from extensive research of WW2. The defender advantage is in rapidly equipped defense adopted by 1.3, 1.5 for prepared defense and 1.6 for defense with field fortifications. Tagged 1943, 1944, germany, uk, usa, wehrmacht.